I made the mistake of decorating for Easter on Friday (03/22), when Easter is still a full month away. Two days later I was already tired of looking at the stuff, so today I ended up removing some of the decor and spreading some other stuff elsewhere so it’s more minimalist. I feel much better. I’m finding that I prefer a more minimalist look in general, like I had going for St. Patrick’s Day. This is great because I’ll save money owning less decor in general. 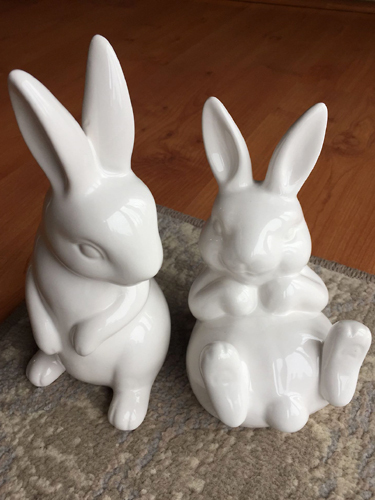 Incidentally, I finally found something I’ve been looking for since last year – white ceramic bunnies! They were in the Target dollar spot for $3 each and were sitting in random spots so I’m not sure whether they’re supposed to be more poses. Nothing ever seems to be organized in the dollar spot. I used to think it was laziness on the part of the employees but now I’m convinced it’s a ploy to make people spend more time in that section hunting for treasures, because you do tend to miss the best stuff if you do a quick once over. Saturday (03/23) we took a big bag of old paperwork to a neighboring village to be shredded. I’m so relieved to have that out of my house. I’m getting ready to donate some of the stuff I have listed on Offer Up that isn’t selling as well, just to get it out of my house. I’m tired of it sitting in the spare room / office. After the shredding event, we had lunch at BonChon in Schaumburg and it wasn’t as good as the first time. The spicy and soy garlic chicken was just as good as before, but I opted to try the pork buns… and while they weren’t terrible, they aren’t something I’d order again. Joe didn’t care for them either. Sunday (03/24) I discovered the deliciousness that is roasted carrots. Can you believe I’ve lived 43 years not really loving carrots? I don’t mind them in soups or stews but I’d never eat them on their own. I tossed them in olive oil and sprinkled them with salt and pepper before roasting them at 400 degrees for about a half hour. The best part? I added some honey to melted butter and drizzled it on the finished carrots. OH MY GOD were they good. I enjoyed them more than the main course! I have been roasting green beans for a few weeks now too, so now I need to try roasting other vegetables that I thought I didn’t like. Apparently the cooking method really does make a difference when it comes to taste.